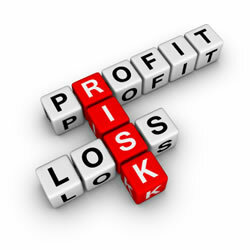 Risk and reward are the two sides of the investment decision - accompanied by the emotions of fear and greed. Broadly speaking, rewards - in terms of the rate of return that you can obtain - will increase with risk, as the individual investors will usually seek a risk premium. So, as well as looking for good returns, you need to understand what risks you are taking with your money when investing. Only you know how much risk you are comfortable with - but if you are not fully aware of the risks you could be making the wrong investment decisions. With shares, the market value may fall, due to market cycles or due to market dissatisfaction with the company's performance. The impact of these risks will depend on the time-frame or time-horizon that you are willing to consider. Usually, for the more risky asset classes, you should be prepared to leave the assets invested for 3-5 years - or more to allow for the possible fluctuations in value. For the DIY Income Investor there are two main types of risk: loss in capital value (or resale value) and loss of income (meaning the yield falls). Asset classes differ in their risk profile between the two types of risk. For example, reductions in a company's dividend usually results in a falling share price as well; the issuers of some fixed-income investments (such as preference shares or PIBS) can stop dividend or coupon payments, whilst with corporate bonds the income is usually fixed for life - the maturity of the security or the failure of the issuer! Going the DIY route means that, while you may not avoid these common investment faults, you should be better informed about them. reckon that the more you learn, the more cautious you will become! And the DIY Income Investor approach, based on the Income Pyramid, is inherently cautious. However, you may choose to use part of your portfolio for deliberately more risky rewards - for example, some of the highest yields available to private investors are returns are for slightly 'risky' fixed income securities (see the Portfolio above) - whilst failures are very infrequent.